Planet Pluto d$ 1.00 ea. The ATM d$ 2.00 ea. The Comedy Planet, Featuring Sid! Castor & Pollux d$ 3.00 ea. Harvoid Constellation d$ 5.00 ea. 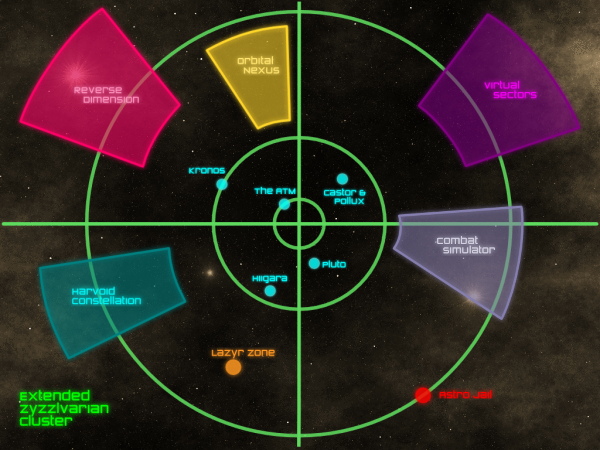 Virtual Sectors d$ 5.00 ea. Combat Simulator d$ 5.00 ea. Orbital Nexus d$ 8.00 ea. Astro Jail d$ 8.00 ea. Lazyr Zone d$ 10.00 ea. Reverse Dimension d$ 10.00 ea. This page and some of the others in this Hunt originally had a META REFRESH tag causing it to be reloaded periodically to show updated content. As the pages are static now, these tags have been commented out in 2010 by the archivists of Beginner's Luck.